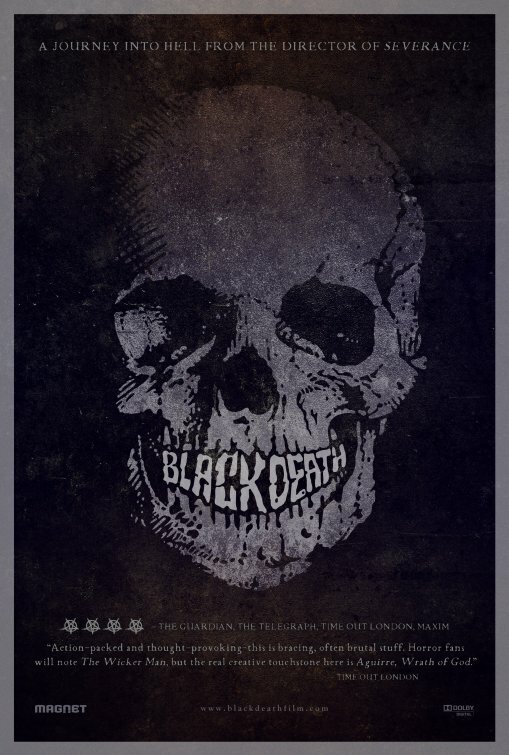 Movie Review: BLACK DEATH (2011). 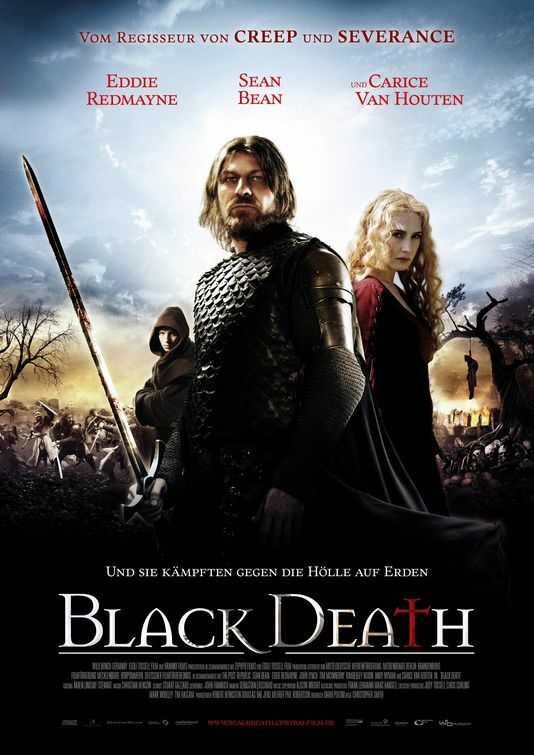 Black Death is a few different kinds of the best kind of movie. It’s a movie that constantly surprises. Just when you think it’s one thing, it becomes another. It’s relatively short and simple but just try to predict where it goes. More profoundly, it’s a movie that is brave and willing to challenge its audience. If you let it, it will make you think, maybe even make you reconsider what you think you believe, if only briefly. But last and best of all, Black Death is a true horror movie. Director Christopher Smith has already amassed an impressive curriculum vitae of creature features and creepfests (read my reviews of Creep, Severance, and Triangle! ), but Black Death is a level up. It’s a movie that is viscerally unnerving and intellectually disturbing. It’s a canny, vital, destined-to-be-overlooked piece of work. Black Death takes place in 1348,at a time in real human history when theBlack Death was decimating half the population of Europe. In one monastery, a young monk named Osmund (Eddie Redmayne) is carrying on a secret affair with a sweet young woman named Averill (Kimberley Nixon) while carrying all the guilt and shame that this crisis of faith might bring. Osmund sends Averill away in an attempt to protect her from the plague, and he prays for a sign to give him some reason to leave and follow her. As if on cue, an intense knight named Ulric (Sean Bean) arrives at the monastery, with a papal sanction to investigate rumors of a wicked necromancer who rules a distant marshland village and defies all civilized religion by bringing the dead back to life. Osmund volunteers to serve as guide to Ulric and his men, in the hopes that he can slip away from them and rejoin Averill. Of course, things don’t go as planned, and Osmund is drawn deeper into the violent outside world of Ulric’s warlike nature, along with the upsetting sights that are encountered along the way. By the time the small group of warriors and their monk guide arrive at the remote village of the necromancer, Osmund will see some things that will challenge everything he knows. I spent more time than usual on the setup because I’m so impressed with it – credit to screenwriter Dario Poloni – Black Death starts out as a period men-on-a-mission like last year’s Centurion, but quickly descends into the nightmarish scenario of a ’70s film such as The Wicker Man. The Wicker Man is an obvious point of reference for Christopher Smith and his crew, but I’d argue that Black Death is the better movie even than that long-acknowledged classic of British cult cinema: The Wicker Man has that horrific and haunting ending, but what precedes it is not nearly as memorable. By comparison, Black Death is the more consistent film, and the reason for that is the excellent character work done by Poloni and Smith and a thoroughly terrific cast. Sean Bean’s character is the central figure of the film, depending on how you interpret the tale, he’s a determined man of faith or an all-too-recognizable monomaniac. That’s not the first impression, by the way: The first impression he gives is of very traditional heroic iconography. Sean Bean is one of the more famous British actors – we know him best here in the States as Boromir from the Lord Of The Rings films, and he’s currently ripping it up in HBO’s Game Of Thrones series. This guy does with a medieval tunic and cloak what Pam Anderson did for red bathing suits (well, not exactly that, but you get my point I hope). You see Sean Bean all duded up in chain mail, and you start getting all optimistic, like Black Death is going to be a swashbuckling, somewhat smaller-budgeted Fellowship Of The Ring. The first cue that suggests that this is a much different, far darker scenario is when we start meeting Ulric’s crew. Outside of the dignified and level-headed Wolfstan (John Lynch), the men who Ulric commands are mercenaries at best and near-monsters at worst – there’s the vicious and uncouth Mold (Johnny Harris), the way-too-into-his-work and poorly-groomed torturer Dalywag (Andy Nyman), the grim and doom-eyed Griff (Jamie Ballard), the flippant and venal Swire (Emun Elliott, a doughy dead-ringer for Colin Farrell), and the mute, looks-exactly-like-Klaus-Kinski Ivo (Tygo Gernandt). Seriously, I’m not sure where Black Death’s casting directors dug up a guy who looks that much like Klaus Kinski, but good work by those folks: This is one surly-looking bunch. And these are our heroes. Add to that mix Eddie Redmayne as the supposedly naïve and unworldly Osmund. Right from the beginning, due to the secret affair, he’s not the innocent all of the other characters would like to think he is. Also, I hope this doesn’t sound mean, but he’s a strikingly odd-looking figure. The performance is terrific, but almost from the start, Osmund, the audience identification figure in Black Death, isn’t quite right – in a quite perfect way. We don’t really know which way Osmund is going to go, which is why the end of the film is so perfectly unexpected and uniquely unsettling. I’m deliberately leaving out the last few key characters, including Black Book’s tremendous (and extremely lovely) Carice Van Houten and Tim McInnerney (previously from Smith’s own Severance) as suspicious members of the marsh-bound village that is Ulric and Osmund’s ultimate destination. I don’t want to even identify which characters they play, because the less you know about Black Death going in, the more power it will have. And I strongly urge you to see it. 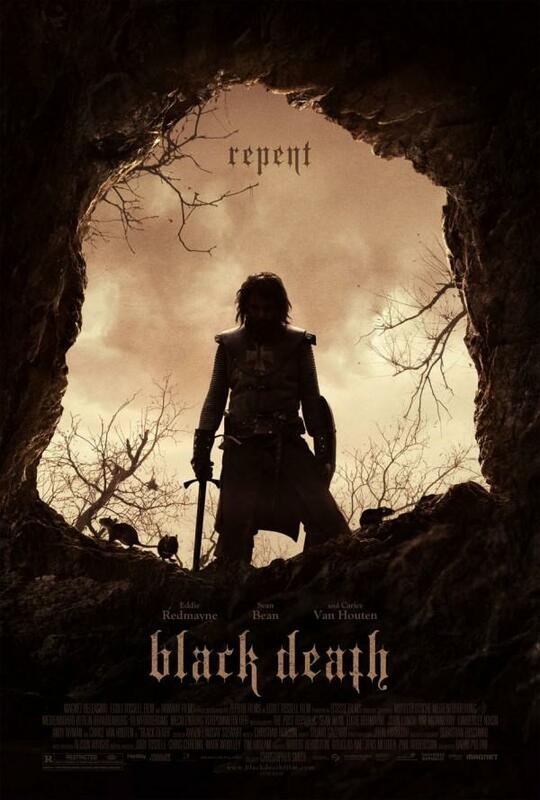 Black Death deserves all kinds of accolades for its convincing production design, atmosphere, and period detail, and its cast is uniformly terrific. Not for a moment do we doubt the realism of the world that Poloni has written and Smith has brought to screen, and that’s exactly what makes it so haunting and impossible to forget. Movie Review: HOBO WITH A SHOTGUN.